After a quiet summer, with time to re-charge our batteries, we’re all ready now for a busy month ahead. The month starts with the very popular Sowerby Bridge Rushbearing Festival on 1 & 2 September, a fabulous community event full of music, dancing and following the iconic Rushcart as it is pulled through the local villages, starting in Warley on Saturday and finishing in Ripponden on Sunday evening. 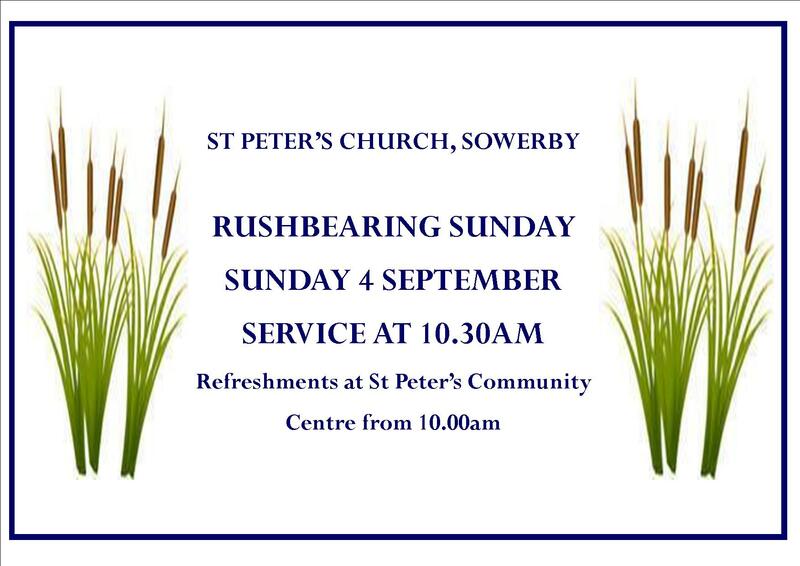 One of our favourite events of the year, we are proud to be an integral part of the festival, kicking off the programme of events on the Sunday morning with our Rushbearing Service at 10.30 am and refreshments across the road from church in the Community Centre from 10.00am. We hope to welcome many of you back the following weekend, 8 & 9 September, as we open our doors to visitors as part of the national Heritage Open Days scheme. 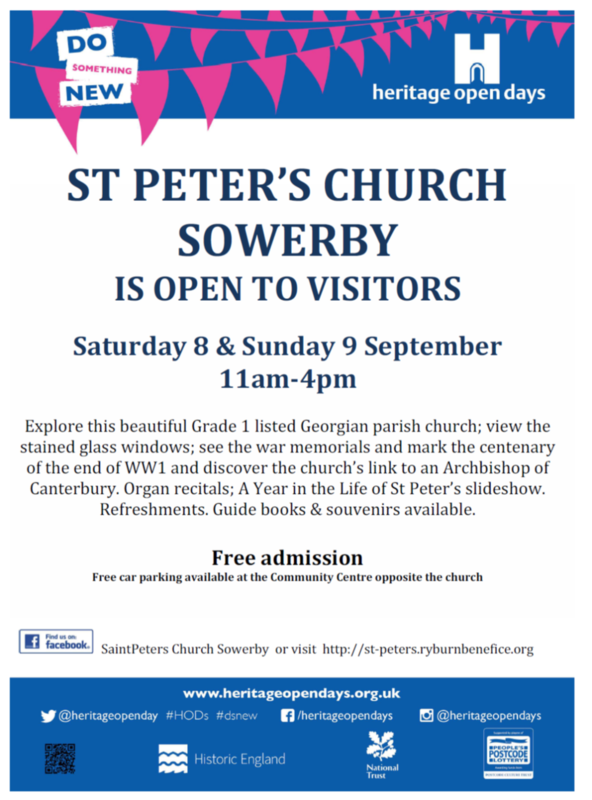 Maybe you’ve been to a wedding or christening and not had time to properly look around the church’s architecture and beautiful stained glass windows; maybe you’d like a little time to sit and reflect while listening to our visiting organists play; or maybe you’re interested in the history of our link to an Archbishop of Canterbury and our memorials commemorating wars from the Crimea to the present day. In any case you will find a warm welcome by our team of volunteers and the kettle’s always on! 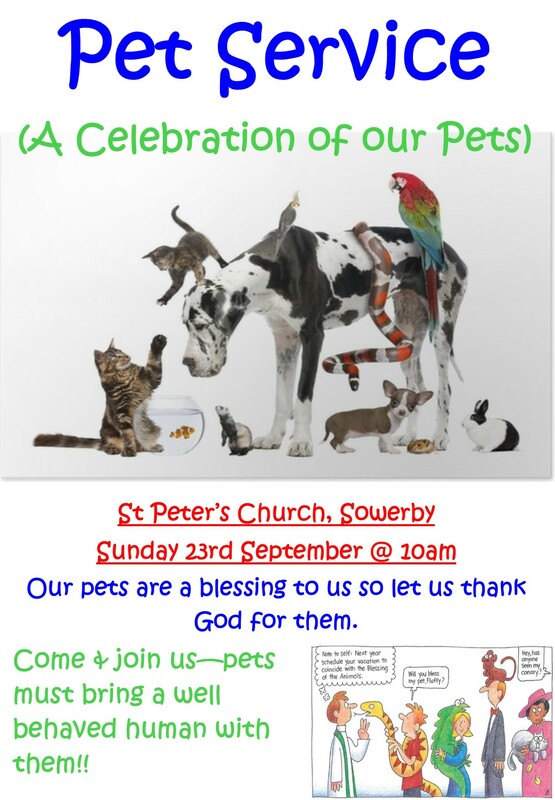 Finally, on 23 September, we will be having a Pet Service at our regular time of 10.00am, when we will be giving thanks to God for our companions great and small, and the love and joy they bring to our lives. All pets must be accompanied by a well-behaved human! 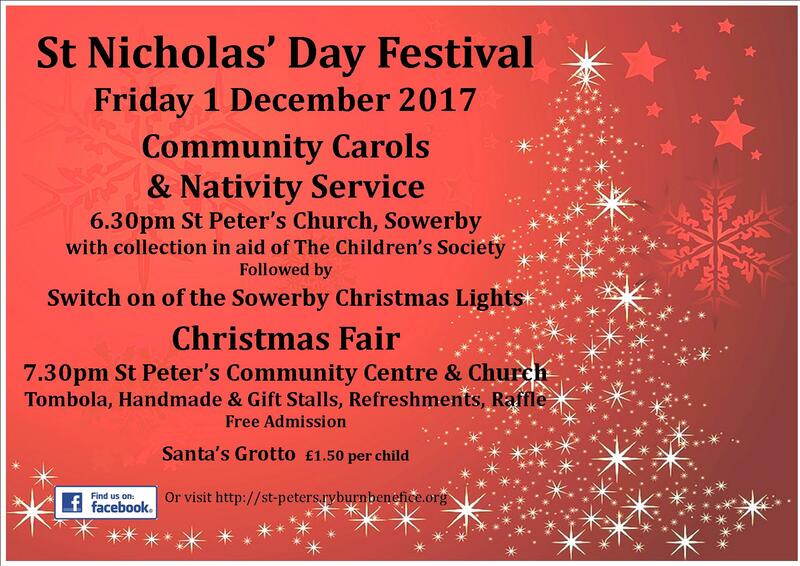 Our annual St Nicholas’s Day Festival is this coming Friday 1 December. The evening starts with a Carols & Nativity service in church at 6.30pm, including children from Sowerby Village Primary School making the nativity tableau, and during which there will be a collection in aid of The Children’s Society. 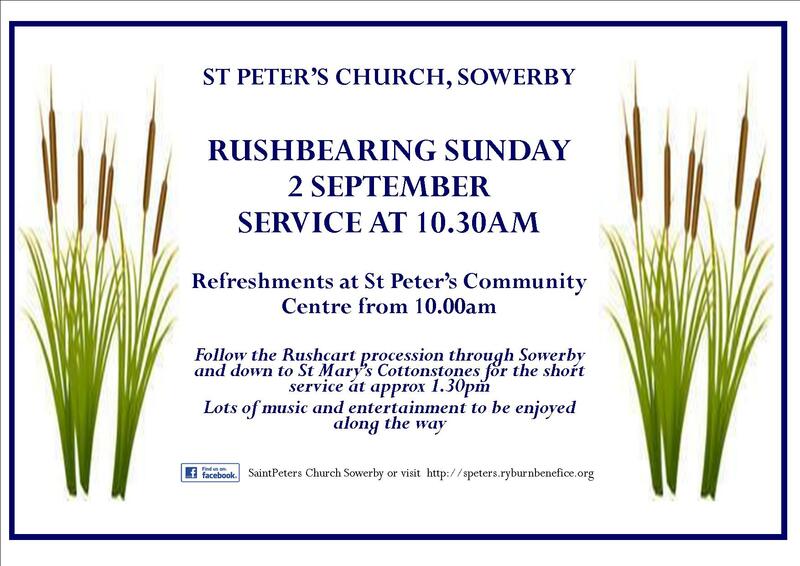 Following the service, at approx. 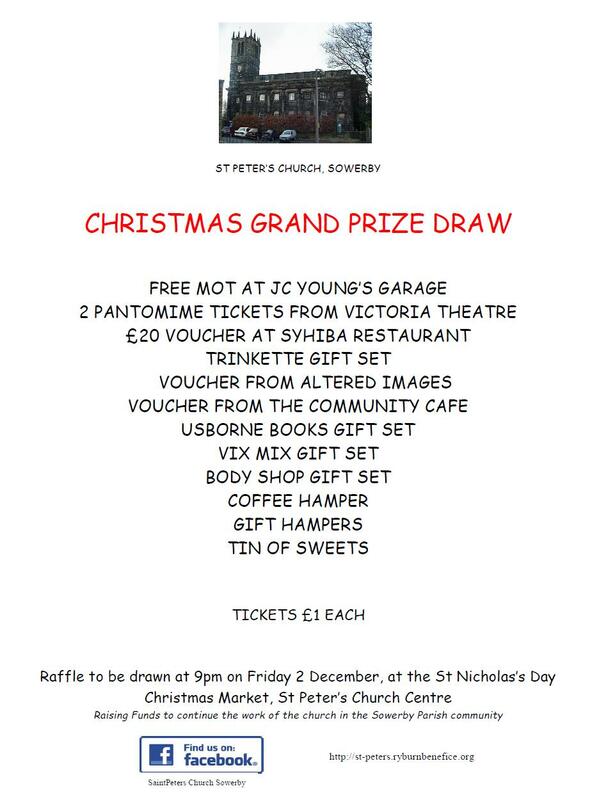 7.30pm, our Christmas Fair will be open, with stalls in the Community Centre (opposite the church) and at the back of church. Stalls include Trinkette, Sowerby Village PTA, tombola, lucky dip, Guides & Brownies, face painting, knitted goods and handmade gifts. Santa’s Grotto will also be in church – come along and say hello. We have two fundraising events coming up in the next week. 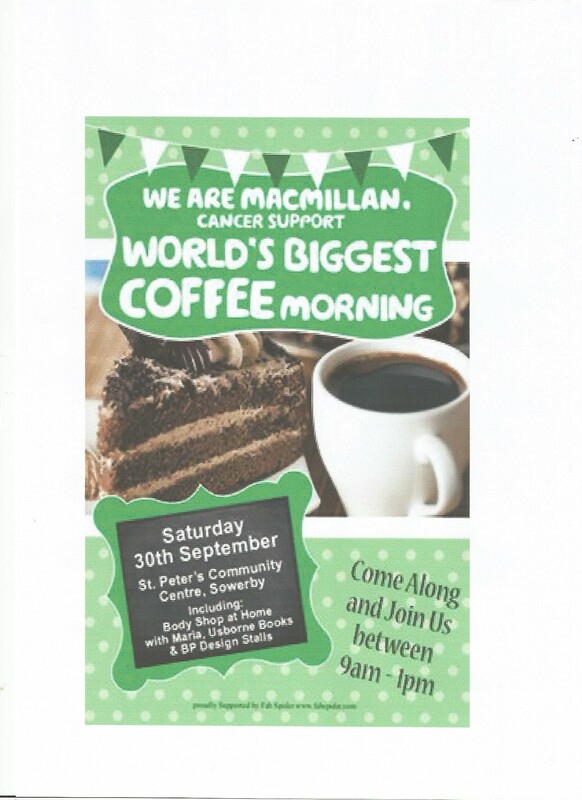 Firstly, running alongside the Community Café this coming Saturday 30 September, is a Macmillan coffee morning and we’re pleased to support such a worthwhile and popular cause. 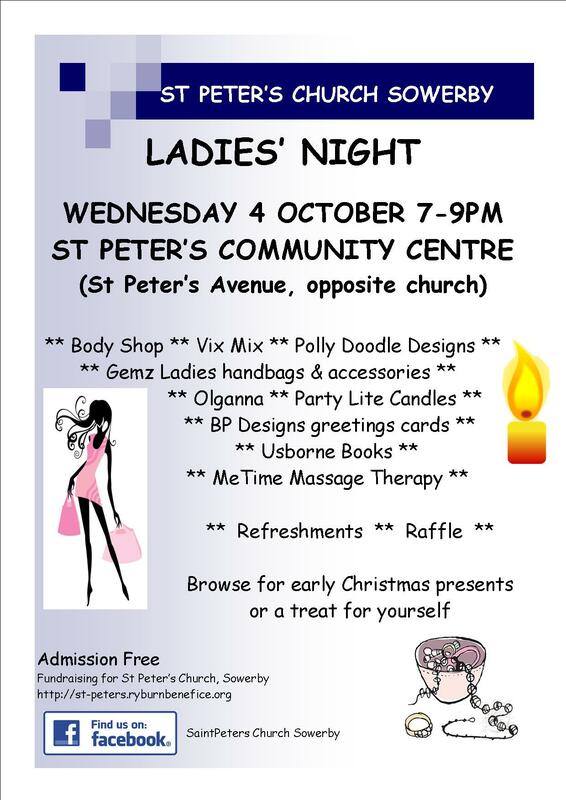 The following Wednesday sees the return of our annual Ladies Night fundraiser. 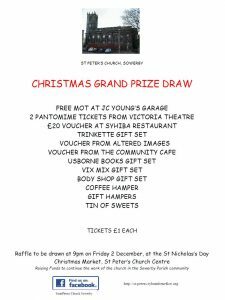 Gather your friends and come along to St Peter’s Community Centre (opposite the church) for a chance to bag some bargains and make inroads into that Christmas shopping. 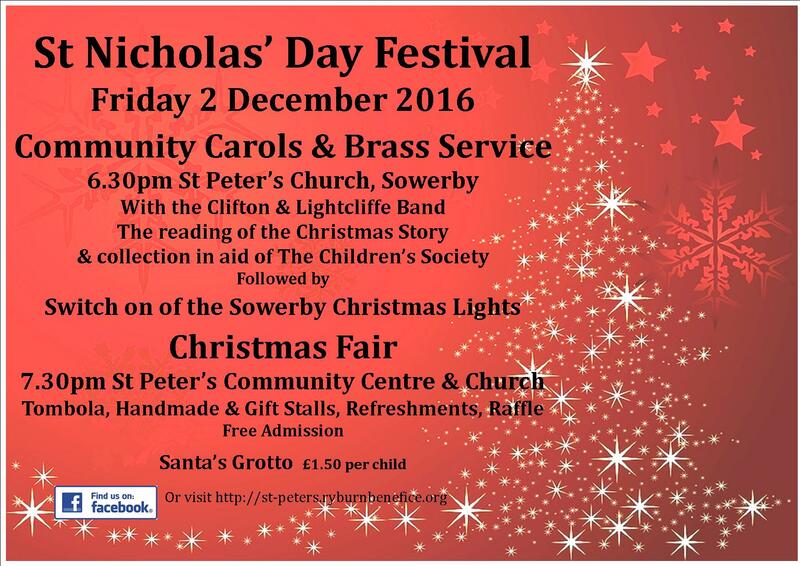 The St Nicholas’ Day Festival is a popular annual event in our calendar. The evening starts at 6.30pm with a Carols & Brass service in church, including local schoolchildren telling the nativity story. 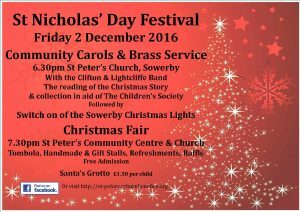 We will be joined in the carol singing by the Sowerby Village primary school choir and the Clifton & Lightcliffe Band. 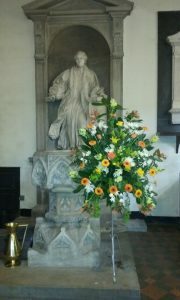 During the service there will be a collection in aid of The Children’s Society. Following the service at approx 7.30pm, gather across the road by the flagpole for the switch-on of the village Christmas Lights. The Christmas Fair is open in St Peter’s Community Centre, opposite the church, from 7.30pm with refreshments, including mulled wine and hot dogs. Raffle tickets will be on sale. with the raffle drawn at the end of the evening. Our thanks go out to all the wonderful local businesses and individuals who have supported us with donations again this year. This year’s stalls have a wide variety of goods on offer including handmade gifts, children’s and adults’ jewellery, candles, Body Shop, handknitted and sewn items, Beever hair care products, as well as a tombola, cake stall, badgemaking stall and Play Your Cards Right game, plus stalls supporting community groups such as the Brownies & Guides, Sowerby Village PTA and the Sowerby Lights Association. 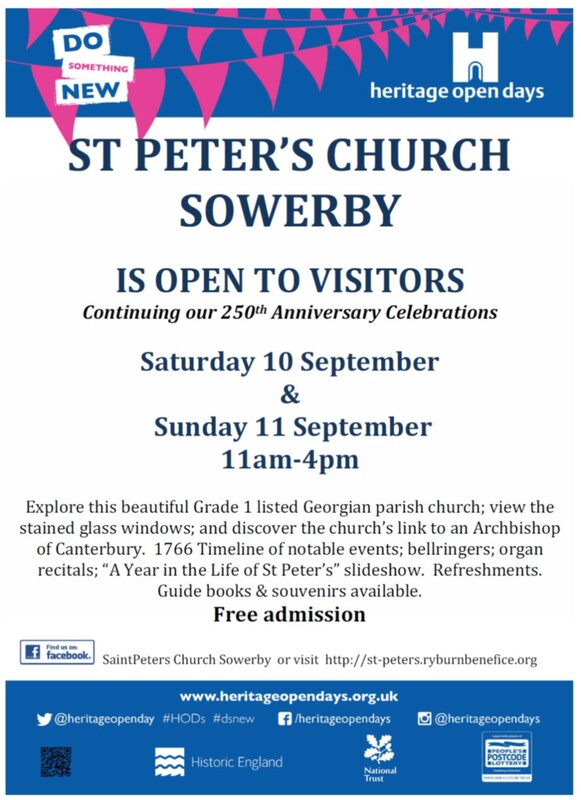 There’s so many stalls the Fair has expanded into the church this year! 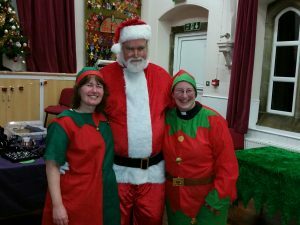 Santa’s Grotto is also in church from 7.30pm onwards so come along and say hello to Santa and his elves. Free admission to the Fair, £1.50 per child for Santa’s Grotto. On Saturday 17 September we will be welcoming the Lightcliffe & Clifton Band as they entertain us with a selection of tunes on the theme of “Brass at the Movies”. Join us for what promises to be a fun, social evening. Refreshments available. All are welcome. As we continue to mark our 250th anniversary, we will once again be opening our church doors to welcome in our community on 10 & 11 September as part of the National Heritage Open Days scheme. 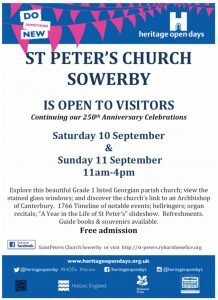 If you haven’t visited us for a while, this is the perfect chance to view the beautiful stained glass windows, have a closer look at the Community Altar Cloth and find out more about the locally-born Archbishop of Canterbury. Free admission. Guide books and souvenirs available. Refreshments. 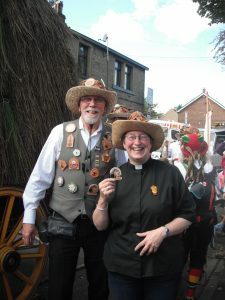 This year’s Rushbearing Festival is on Saturday 3 & Sunday 4 September. 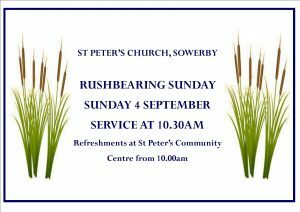 The event on Sunday starts with a community service at St Peter’s church at 10.30am, where the old rushes are removed and the new rushes are presented, and we are entertained with traditional dancing. The entertainment continues outside the church after the service and homemade refreshments are available at the Community Centre opposite church. For more information, visit their website.